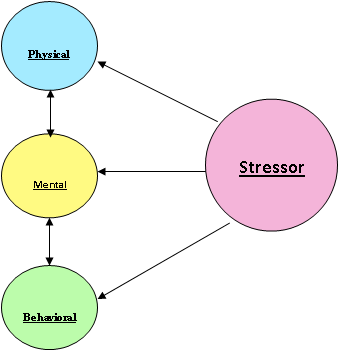 So when we refer to stress management, it means keeping our stress level motivating but not physically or mentally uncomfortable. One last point to make about the nature of stress is that it tends to add up over time. Because stress often builds gradually, it tends to go unnoticed until a “stress symptom” such as a headache, neck tension, or stomach “butterflies” finally grabs our attention. Because we are out of touch with our bodies, we don’t notice these sensations until they are quite intense. Then when we try to do something about them, we aren’t successful and we feel more stressed because we are “out of control”. It is much more effective if we learn to tune in to our bodies’ wisdom and catch rising stress earlier. That way it may take very little to reduce our stress (such as the brief techniques mentioned later). 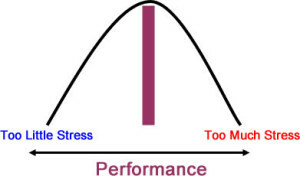 It looks like the diagram below where the short lines represent the added buildup of stress and the short arrow picks stress early and reduces it, while the longer arrow represents noticing stress at a later time and being more difficult to reduce. A second approach is containment of your reactions. An example here would be learning a relaxation technique such as slow, calm self-talk or breathing. It also includes longer techniques such as meditation. Since each stressful situation may require a different behavioral approach, we will concentrate on the second approach in this article. Below is Dr. Morry Edwards’ Stress Management Six-Pack (De-Stress instead of Distress). There are six brief stress management strategies that you can do throughout the day (not necessarily instead of deeper relaxation periods) to keep the stress level more manageable. Remember this is an ongoing commitment. You don’t do them once or for a short period of time. The more you practice, the more your old stress habits are replaced with greater control over your emotions and reactivity and become new healthier habits. 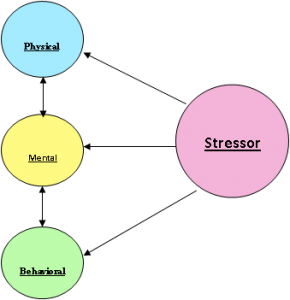 Identify your “stress barometer”. This is the area of your body that is most reactive to stress. Every 15-20 minutes focus your attention on that area. Take two seconds and notice the tension level (O= no stress, 1= mild, 2= moderate, and 3= severe). If you are at 0 or 1, continue what you are doing. If your stress level is 1.5 or greater, do something brief, right then to back off and keep your stress from escalating. The next five techniques can be quick, practical, and done “in the heat of the moment”. Is a single breath that serves as a SIGNAL to let loose and slow down. It has three simple steps. 1) Focus your attention on the center of your forehead. 2) As you breathe in through your nose, let your eyelids close. Breath smoothly, evenly, and somewhat deeply into the diaphragm. 3) Hold your breath for two seconds and with your lips as a valve, exhale fully through your mouth until your “belly” is empty. Feel yourself float or a pleasant sensation flow through your body. Short shallow breathing or holding your breath and tensing up adds to stress. Become more mindful (conscious) of your breathing patterns. When you “catch” yourself in a stressful breathing pattern, take at least two deliberate, slow, deep breaths into the “belly” area to break up stress. When you inhale say, “I AM” and when you exhale say, “RELAXE” or “CALM” or “QUIET”. Try to take 2-5 minute breaks at least four times a day. This is a controlled daydream. For 2-5 minutes takes yourself back to a place where you felt totally at peace. Use as many of your senses as you can, in as much detail as you can. Become totally absorbed. Feel the sun on your skin. Hear the waves gently flowing in and out. Smell the salty sea air. See the sun dance on the water. This can be used, if the breathing techniques are not helpful. This technique can also be used along with the breathing, if that is helpful. Again try to do this 3-4 times a day when you begin to feel stressed. It is less expensive than a trip to Lake Michigan or the ocean and more practical! When your thinking begins to race or gets stuck in one particularly stressful groove learn to “CHANGE CHANNELS”. You could use some other catchy phrase to break up your negative thinking, if you would rather. You could even imagine a television screen in your mind where you take your remote control and switch to a more positive channel. Then, refocus on a repetitive thought that would be calming or reassuring such as “I CAN HANDLE THIS.” As an alternative, vividly imagine yourself handling the situation. Not violent! Stretch tense muscle areas. Massage an area. Take a brief walk. Take a break. Do something to discharge the tension that has built up. It is important to use this strategy several times a day so that increasing muscle tension does not drain your energy or over tax your body. Tensing muscles needlessly is a waste of energy much like heat going up your chimney rather than heating your house. Become aware of bracing or tensing habits such as clinching your teeth and retrain yourself to relax each time. Two other brief strategies are also useful. They are listed below. (formerly THE HEART LOCK-IN®) was developed by Doc Childre of the Heart Math Institute. First, identify when you are getting upset. Refocus your attention on the area over your heart and imagine breathing in and out through your heart slowly, smoothly evenly and gently to a count of five. Imagine the area of your heart expanding and re-experience a feeling of appreciation or being genuinely appreciated. (QR) was developed by Charles and Elizabeth Stroebel. It has quick steps. 1) Smile both inwardly and outwardly. 2) Say a Quieting Phrase to yourself. 3) Take one or two moderately deep slow breaths. 4) Focus on tense body areas and let loose. Repeat throughout the day.